Research proved that weight gain is determined as very harmful for heart which leads to premature heart fail. For this, one must focus on meaningful weight loss and if weight loss is not possible, then focus should be on weight stability. Read detailed information by visiting attached post. 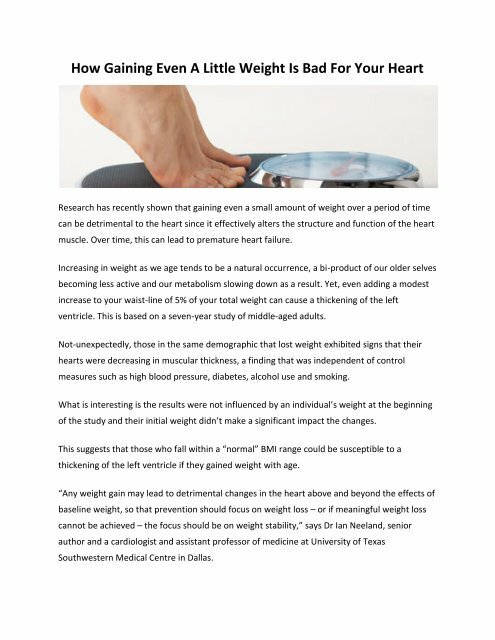 How Gaining Even A Little Weight Is Bad For Your Heart Research has recently shown that gaining even a small amount of weight over a period of time can be detrimental to the heart since it effectively alters the structure and function of the heart muscle. Over time, this can lead to premature heart failure. Increasing in weight as we age tends to be a natural occurrence, a bi-product of our older selves becoming less active and our metabolism slowing down as a result. Yet, even adding a modest increase to your waist-line of 5% of your total weight can cause a thickening of the left ventricle. This is based on a seven-year study of middle-aged adults. Not-unexpectedly, those in the same demographic that lost weight exhibited signs that their hearts were decreasing in muscular thickness, a finding that was independent of control measures such as high blood pressure, diabetes, alcohol use and smoking. What is interesting is the results were not influenced by an individual’s weight at the beginning of the study and their initial weight didn’t make a significant impact the changes. This suggests that those who fall within a “normal” BMI range could be susceptible to a thickening of the left ventricle if they gained weight with age. “Any weight gain may lead to detrimental changes in the heart above and beyond the effects of baseline weight, so that prevention should focus on weight loss – or if meaningful weight loss cannot be achieved – the focus should be on weight stability,” says Dr Ian Neeland, senior author and a cardiologist and assistant professor of medicine at University of Texas Southwestern Medical Centre in Dallas.